Organising your images can seem a laborious and thankless task at first, but the payback comes when you need to find a photo among thousands of old images and, by using the right software and techniques, it needn’t be too much effort. Professionals rely on a well-organised library of images to be able to source an image at will, and image tagging is key too if you want to sell your images through a picture library. For the amateur snapper the editing process is almost as key as the principal photography, so requires a fair bit of time and attention to get it right – but put the work in and it will make for easy searching at a later date. This is where consumer software has come on in leaps and bounds over the past few years. A huge variety of packages – iPhoto, Elements 8, ACDSee, Lightroom and many more – can organise, date, attribute keywords, geographically tag, and arrange your photos in a highly customisable fashion. The more accurately this is done when importing images, the quicker and easier it is to relocate images in your software of choice. At a more professional level there are set standards such as IPTC (International Press Telecommunications Council) that allow for specific personal and important data to be hard-coded to an image’s metadata (can be sourced irrelevant of software used) to ensure that you remain contactable should an image be sought for publication, for example. Some software is free, others have an affordable asking price, while some may cost that bit extra, but this will often have a bearing on the overall functionality offered. Part of iLife, which comes free on new Macs, it’s no slouch. Import, Organise, even share to social networking sites like Flickr. iPhoto ’09 can not only detect faces but recognise them too, attributing tags automatically when it ‘learns’ a face. It’s not entirely bug-free, but certainly extremely clever and great for quick tagging your friends and family. Despite being a free download from Google, Picasa is a powerful tool for both PC and Mac that is easy to use for the new user. It’s very functional and can even read Raw files from fairly new cameras too. Add to that some basic post-production tools and online hosting and sharing, and Picasa has a whole lot to offer and costs absolutely nothing to boot! Photoshop Elements tends to be deemed as a photo editor and, while this is true and its primary purpose, it also has a great organiser with much of the same functionality as Apple’s iPhoto. For not too much money PC users can take advantage of this all-in-one package that will not only see you get to grips with organising images, but editing them too. The professional’s solution, Lightroom 3 not only has an intuitive Import function and Library, it has a whole host of Develop and output options too. Really one for those shooting a Raw-based workflow, Adobe Camera Raw 6 features and can crunch through images from the most up-to-date cameras in seconds. It’s all about speed thanks to the 64-bit install allowing access to large amounts of your computer’s RAM. 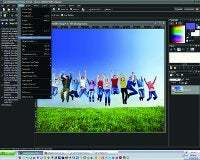 Corel’s long-standing PaintShop Pro series updates with the new Photo Pro X3. Adding a library/organiser function to an already well-established image-editing software means everything can be approached from the one program, though the user interface isn’t the most attractive if we’re being fickle. Otherwise Corel offers a full package from start to finish, though processing can be fairly CPU-intensive.